STUDIO VISITS AVAILABLE BY APPOINTMENT CONTACT the studio to schedule a time to see the space and/or Reserve A Date/Time for your Event. Your Total Guest-Count and Payment are Due in the studio TWO weeks prior to your event. 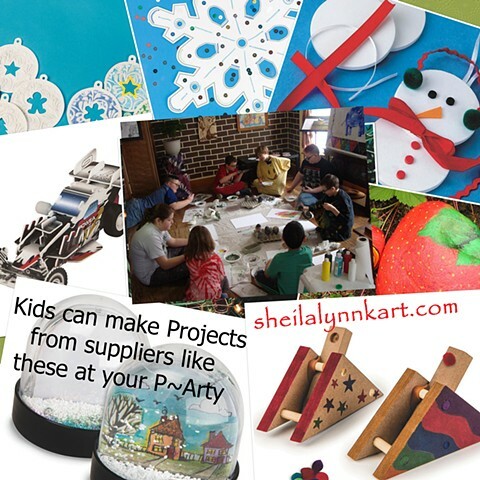 Team- building activities, individual painting/drawing/sculpture projects, holiday-themed projects, book arts, oragami, fabric/string art, mosaic projects, jewelry making, make your own lip balm, home decor projects, healing art activities, and more. Additional suggestions and requests welcome. The artist/owner does NOT provide or sell food or beverages. You may bring your own. The studio will be open 20 minutes prior and 20 minutes after your event. Additional set-up/clean up time available when requested in advance. When received SEVEN days prior to the scheduled event date, you will receive a full refund (minus your $25 non-refundable deposit) in the form of art supplies already ordered for your event and any balance remaining after that purchase. You may have the option to reschedule your event using supplies already purchased depending upon space availability. If you have requested an artist-guided project for your rescheduled event, your supplies will be held in the studio until the new date/time of your event. For Best Results Contact the studio to discuss or pre-arrange any accessibility concerns. Participants of all abilities are welcome at Studio Events. The Artist/Owner is a Spinal Arachnoiditis Survivor unable to provide physical assistance to patrons in need. ONE Adult Personal Assistant to persons in need may attend your event for FREE if arranged in advance. The front entrance has three steps and the outer door entrance is 31" wide. This may be too narrow for a standard wheel chair. Wheel chair access will require a physically able-bodied person(s) to lift and/or fold the chair, assist the participant, etc. Weather-permitting, a vehicle can pull up in the front drive-way for easy access to the front sidewalk. The studio space is quite open and, to the best of our ability, tables & chairs can be arranged to meet specific needs if requested in advance. As this is a studio and business in a house built in 1917 in a residential area, specific ADA accessibility requirements have not yet been met. Sincere apologies for any inconvenience this may cause.